At the 50th ISSF World Shooting Championship in Munich, American Joshua Richmond shot a perfect 50 in the finals to win the Double Trap World Championship. Shattering 50 out of 50 targets in the final stage, Richmond hit 196 total targets overall (out of 200 possible), equaling the current ISSF World Record record set last year. That record was set by China’s Hu Binyuan, who took the bronze in Munich, after Russia’s Vasily Mosin captured the Silver Medal in a tie-breaker shoot-off. Richmond’s victory secured an important Olympic Quota Place for Team USA. Josh is currently a member of the U.S. Army Marksmanship Unit (USAMU) at Ft. Benning, Georgia. You can watch Richmond’s amazing record-tying performance on the ISSF-Sports.org website. CLICK this LINK, then select “Final Double Trap Men” on the Right. Share the post "Richmond Ties Record in Winning Double-Trap Championship"
Government officials in the UK have banned blank-firing starter pistols, claiming they can be converted to fire live rounds. As of June 4, 2010, possession of an Italian-made, bright orange Olympic .380 BBM starter pistol is now a criminal offense (whether or not the pistol has been converted), with a mandatory 5-year jail term. Approximately 1500 of the Olympic starter pistols have been imported into the UK since 2006, and they are widely used in other countries. 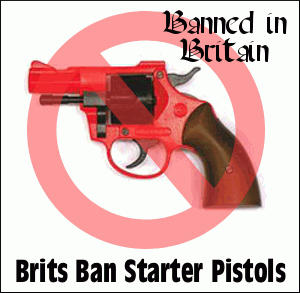 UK officials announced an amnesty during which the starter pistols could be surrendered to police in Britain and Wales. But the amnesty has expired. Now, if prosecuted, those who did not give up their starter pistols will be locked up for five years. According to BBC Online: “After 4 June the weapon will be prohibited under the 1968 Firearms Act and anyone caught possessing it faces a mandatory prison sentence of five years.” Note that possession of the starter pistols is now illegal whether or not the pistols have been converted to fire live ammo. Imagine being jailed for FIVE YEARS for having a noise-making device, which is all an unmodified starter pistol really is. The purported reason for the starter pistol ban is that a few of the pistols have been converted to fire live ammunition. Law enforcement officials in London claim that black-painted, converted starter pistols have been “linked” to a handful of serious crimes. Share the post "Brits Ban Starter Pistols — Five Years Mandatory Jail Time"
The U.S. Army Marksmanship Unit’s Service Rifle team dominated the 49th Interservice Rifle Championships. USAMU shooters won the coveted 10-man Interservice Rifle team championship and swept every major award at the Interservice tournament, held last week at Quantico, Virginia. USAMU teams also won the the 1,000-yard team match in both the service rifle and match rifle categories, setting a new match record in the service rifle category. With its performance at Quantico, the USAMU completed a sweep of all interservice marksmanship championships in 2010 — soldiers and teams from the USAMU previously won the shotgun and pistol interservice competitions, as a team and individually. Individually, Staff Sgt. Brandon Green was the big winner during the week. He won six championships, including the overall individual championship — his second time winning the prestigious title. He also won the Coast Guard match, the Marine Corps match, the 600-yard match rifle, the 1,000-yard match rifle, and the match rifle individual long-range championship. Members of the winning 10-man Interservice Rifle team were: Sgt. 1st Class Lance Dement, Sgt. 1st Class Grant Singley, Staff Sgt. Tyrell Cooper, Staff Sgt. Brandon Green, Staff Sgt. Joel Micholick, Staff Sgt. Scott Grant, Sgt. Sherri Jo Gallagher, Spc. Kevin Trickett, Spc. Augustus Dunfey, and Pfc. Amanda Elsenboss. Coaches were Sgt. 1st Class Emil Praslick and Staff Sgt. Walter Craig. Cooper was the high individual shooter during the match with a score of 497-21x. Share the post "USAMU and SSG Green Dominate 2010 Interservice Match"